Last weekend I had the pleasure of being part of an intrepid team from PwC's 'People and Change' Consulting practice who joined together to take on the infamous Three Peaks Challenge - climbing, scrambling, slipping and sliding up the United Kingdom’s three highest mountains to raise money and awareness for the women's health charity, Wellbeing of Women and supporting PwC's firmwide fundraising challenge, the 'Race for £3million'. The first was that the ultimate objective of the challenge was to raise money and awareness for Wellbeing of Women - a charity which funds research to tackle problems which affect men, women and babies. Problems that we may not like to 'talk about' yet they are problems that we simply cannot ignore. The second was the opportunity to spend some 'out of the office' time with a great group of colleagues and friends from PwC - some I knew well, others I'd never met before. In an industry where people generally spend more time with colleagues than family it does sound odd to voluntarily spend even more time - a weekend for that matter! - in the midst of office chatter. Having said that, I consider myself incredibly fortunate to be part of a great team within a firm of over 17,000 people - a team which 'works hard and plays hard' and who are among the brightest, most motivated and supportive colleagues one could hope for. And I still maintain that after 24-character building hours together..! 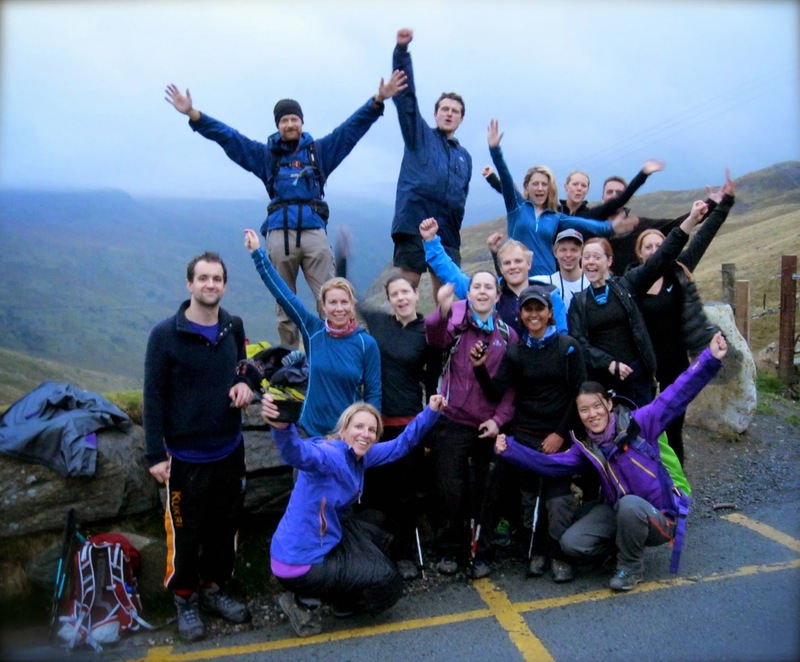 Our Wellbeing of Women Three Peaks team was also made up of friends from the Wellbeing of Women Kilimanjaro Climb, organised earlier this year. Not satisfied with having only climbed Kilimanjaro, there was a general consensus among the team that the next obvious challenge would have to be the Three Peaks. It was fantastic to see everyone again, picking up at the foot of Ben Nevis from where we'd left off on the slopes in Tanzania just a few short months before. We had an early misty morning start at the foot of Ben Nevis in Scotland on Saturday, 26 September, and went on to scale Scafell Pike in England and Snowdon in Wales. Twenty-four hours after we set off, and with blisters, aching legs, fuelled by gummy-bears, KFC, whiskey and hot chocolate we successfully completed the challenge – raising over £1,000 for Wellbeing of Women. Our spirits were high as we tucked into our full-English breakfasts with gusto and satisfied smiles. Was it easy? I'd like to say 'yes' but I have to admit, I was surprised at just how much I had to 'dig deep' particularly in the early morning hours when dozing in the mini-bus that chauffeured us across the country seemed significantly more appealing to getting out and going for a 'walk in the dark'. What made it so much fun and memorable - as with all expeditions - were the people. Jon Gupta from JGExpeditions provided us with a brilliant service with well organised logistics, fun and knowledgeable guides and a focus on our individual well-being balanced with achieving our challenge. Reflective of the dedication and commitment to achieving our sub-24-hour time, we managed to finish at the top of the climbing class – coming in with a time in the top 5% of teams across the country who regularly take part in the challenge. To everyone who participated, followed along and supported us, thanks so much for all of your words of encouragement and patience... and for bearing with many of us who have been tired and a bit achy this week! Wellbeing of Women is a charity dedicated to improving the lives of women and babies in the UK. It’s supported by the PwC Foundation’s firmwide fundraising challenge - Race for £3 million. It's not too late to donate..! http://uk.virginmoneygiving.com/3peaks24hourchallenge.